Large villa with 7 beds and 3 bathrooms. Close to city, nature and sea. 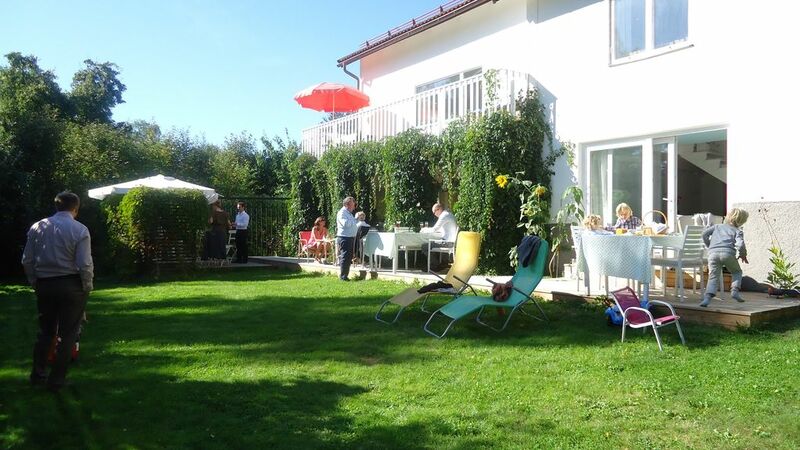 Big 280 sqm (10 rooms) villa with nice garden 10 min from Stockholm City. 3 floors, 5 bedrooms, 7 beds, 3 bathrooms (3 showers, 1 bathtub) + sauna. Large modern kitchen and living room with fireplace. All newly renovated. Big balcony and two decks outside for dinner. Bicycles and childrens stuff available. 300 m from the sea, with several beaches around, and easy access to the Stockholm archipelago with thousands of small islands. Lot's of walking and running trails, sports centers and childrens playground in the neighborhood. Walking distance to grocery store. 2 minutes from bus stop with buses that takes you to the subway in 14 minutes. The subway takes 8 minutes to Stockholm city center. We had a fantastic 10 days stay at Nette's family house. It is a large property with plenty of space for about 4-7ppl. The house is very well equipped. Great kitchen with many cooking gadgets, playroom with table tennis, play station, plenty of board games. Upstairs there are 3 bedrooms plus a sitting area and large bathroom. The main floor has a bedroom, a large kitchen, living and dining room plus another bath. Downstairs is the playroom, bathroom/toilet, as well as the entrance to the beautiful large backyard. Nette is a great host. Communicating with him was effortless. He replied right away to all my questions. Location is as well very convenient. 3 mins walk from the bus stop, 8 mins walk to the nearest grocery store. There is a park nearby with a little playground. If you are traveling with kids, this house is perfect as there are so many toys, swings in the garden and soccer gates. It is also very child proof. Thank you Julia! It was a pleasure to have you and your family as guests! Great place central to almost everything! My family thoroughly enjoyed this residence. It was easy to get just about everywhere in under 30 minutes by car, and easy access to public transportation as well. Plenty of fun for the kids with age appropriate yard toys and for adults, table tennis. Thank you! You are welcome back any time! Angaben im Online_Inserat waren alle korrekt. Lidingö is a beautiful island with lots of nature and the ocean all around. Take a walk along the ocean or go for a run along one of the many running tracks. Or maybe a bike ride (you can borrow our bicycles). If you want to enjoy Stockholm city, it is only 10 minutes away! We will provide an agreement for the rental of our house that both parties will sign at arrival.